What the Zhang Boys Know, a novel in stories set in Washington, D.C., won the 2013 Library of Virginia Literary Award for Fiction. What the Zhang Boys Know, a novel in stories: Set in a condominium building on the edge of Chinatown in Washington, D.C., these stories present the struggle of Zhang Feng-qi, originally from Shanghai, to find a new mother for his sons following the death of his American wife. Along the way, the stories spotlight Zhang’s neighbors as they seek to fill gaps in their own lives. Among them: the young bookseller whose illness renders her barren; the young lawyer trying to cope with a failed marriage; the obsessive painter haunted by the image of a face; the middle-aged woman forced to sell her possessions in order to survive; the sculptor, overwhelmed by longing for the son he didn’t know he had. And then there are the Zhang boys, who firmly believe that their mother is coming back. What is it that they know? Clifford Garstang presents one of the more memorable settings I’ve seen in any book, Nanking Mansion, a renovated tenement in D.C.’s Chinatown, filled with characters whose stories are more fantastic than they first appear. In prose that is measured and confident, he carefully works to show us how these characters’ grief and loneliness becomes unified by their collective setting to transform into something utterly beautiful and unforgettable. What a world Garstang has built for us, and how grateful I was to discover it. What the Zhang Boys Know has a dozen chapters, each one a vivid short story in itself. Garstang makes the whole greater than the sum of its parts. The lives of the inhabitants of a condominium in Washington, D.C’s Chinatown are told separately AND as part of a web of entanglements. The entrances and exits are handled with the deftness of a French comedy, but the empathy of the author brings all the characters achingly alive. What the Zhang Boys Know is a wonderful and haunting book. A widower, a sculptor, a minor poet, an interior designer, and a painter are just a few of Clifford Garstang’s affecting characters, residents of Nanking Mansion, the setting for these deeply satisfying, life-affirming stories linked by neighborliness in a “not-quite-gentrified” neighborhood. Garstang’s characters strive to transcend “the deep quiet of absence” in the wake of all manner of devastations. They leave their doors unlocked, they console, they make room, they share what they have made of sorrow, so proving, as do these stories, the solace to be found in art. 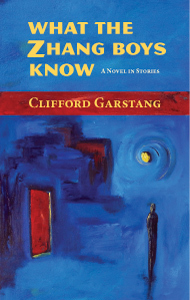 In the tradition of the best volumes of linked stories, from Susan Minot’s Monkeys and Rand Cooper’s The Last to Go to David Schickler’s Kissing in Manhattan, Clifford Garstang’s What the Zhang Boys Know traces a graceful arc, as the meanings and moments in the stories accrue. Garstang’s inventive and original writing, a beguiling invitation to myriad subplots and destinations, offers what every reader desires: a lucid and satisfying experience of literature. Nanking Mansion is the Winesburg,Ohio of the 21st century, and What the Zhang Boys Know is Garstang’s powerfully moving take on place, time, love, and what happens when strangers in a strange land pick community over difference. These stories wrap around one another, and the reader, in a big, warm, bracing human hug. 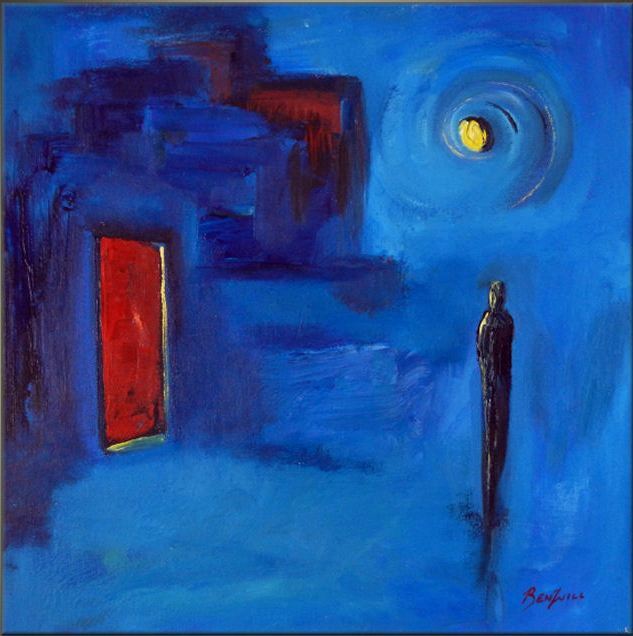 The painting on the cover is “Night in Blue” by BenWill (Benjamin Williamson), a modern abstract expressionist painter living in Portland, Oregon. In reflecting on the philosophy behind his work, he explains, “I don’t want my art to be about standing still, resting on any successes, and becoming complacent. So, it’s important for me to always focus on expanding my work and extending myself on the canvas.” BenWill’s paintings are currently found in collections throughout North America, Europe, and Asia. Information about BenWill and his work can be found at www.benwill.com.